Creatures of the night, beware: I grow garlic! Garlic and onion braids hang from the wooden beams of my kitchen, and they inhabit colorful ceramic keepers on my shelves. 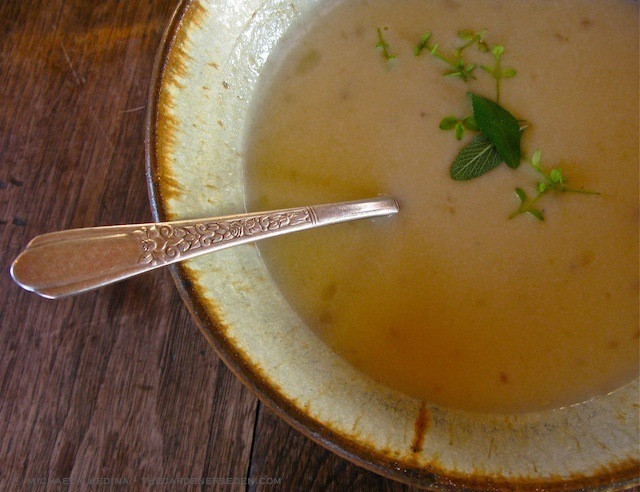 I have garlic galore planted in my garden, squirreled away for winter use upon shelves in paper bags, hanging from floor joists in my cellar, and I cook with this delightfully stinky herb most every night. 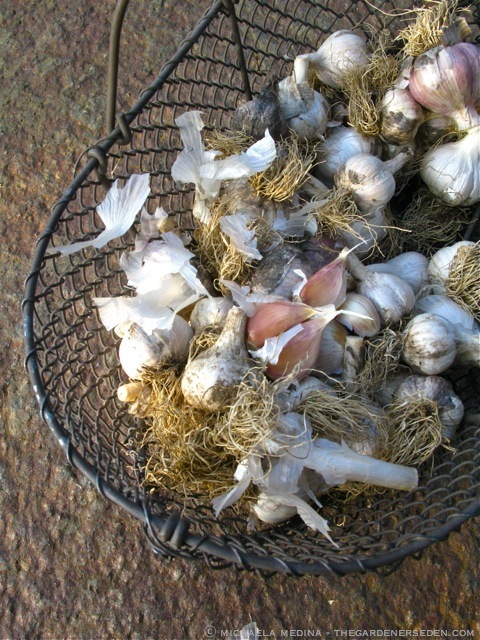 Each autumn, I plant many varieties of cold hardy, gourmet hardneck garlic in my potager (hardneck garlic is the best choice for climates with long, cold winters). It’s a good idea to purchase garlic from growers close to your own home (this ensures the hardiest selections for your climate and local conditions), and traditionally, in early autumn, I visit the annual Garlic & Arts Festival in nearby North Orange, Massachusetts, to select a few more gourmet bulbs for my garden. One of my all-time favorite garlic varieties, which I finally found at the festival a few years ago, is Spanish Roja (a rocambole hardneck garlic). This beautifully colored, hot and spicy selection possesses a true garlic flavor and easy-to-peel cloves, making it one of the most popular —and sometimes hard to find— bulbs at market. This zesty variety and others —including German Red, Bavarian Purple and Russian Red—- tend to be my favorite types for roasting and cooking. 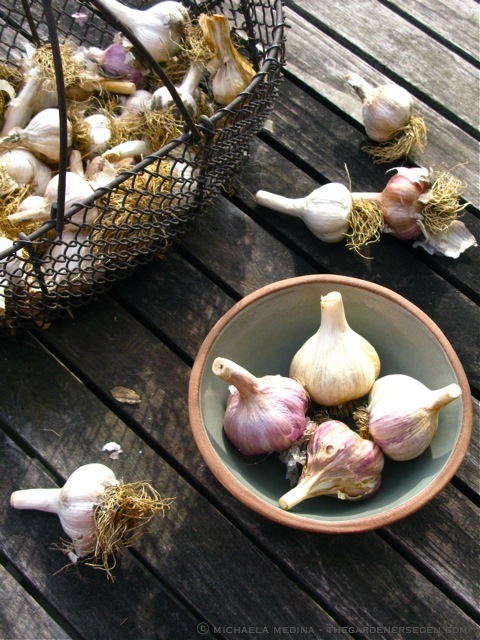 But I also love the milder varieties of garlic —including smokey, medium heat Continental— for salad dressing, salsa, cold pasta and other recipes calling for raw cloves, and for use in subtler dishes. 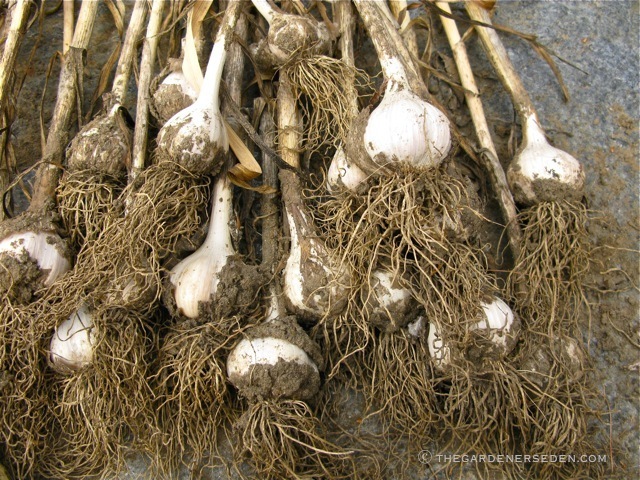 Mid-autumn is the best time to plant hardneck garlic in my climate. Every year I rotate my crop; preparing a new garlic bed with fresh compost in late September. Selecting large, firm bulbs from my crop, I carefully separate the cloves and prepare tags for each variety. On a cool, dry October day, I plant each clove approximately 2″ deep and 4-6″ apart (space wider for big, porcelain bulbs like Music). Mulching is very important in cold climates like Vermont. I use throughly rotted compost and clean straw or ground oak leaves for a nice thick mulch. Read more about garlic planting, and find a link back to removing and using garlic scapes, in my previous post “A Thousand Mothers Set Into Earth” by clicking here. You are currently viewing the archives for Wednesday, September 24th, 2014 at The Gardener's Eden.